The Minister of Transportation, Mr. Rotimi Amaechi, on Thursday said that the Federal Government in its effort to ensure the completion of the Lagos-Ibadan railway by December decided that the company handling the project should move to site and commence work immediately. The minister made this known while briefing newsmen on his meeting with the Lagos state Governor, Mr. Akinwunmi Ambode, in Lagos House on Thursday. The construction company handling the project is the China Civil Engineering Construction Corporation, CCECC. He said that the construction work would involve expanding the already existing two mega stations which are located in Apapa and Ebute Metta, as they are too small. Amaechi also said that the FG on Wednesday awarded a contract on the Tin Can-Oworonshoki-Ojota road and that Dangote was doing one other part of it. “What we are trying to do there is to get good roads to evacuate cargoes, but it will be faster with the rail. 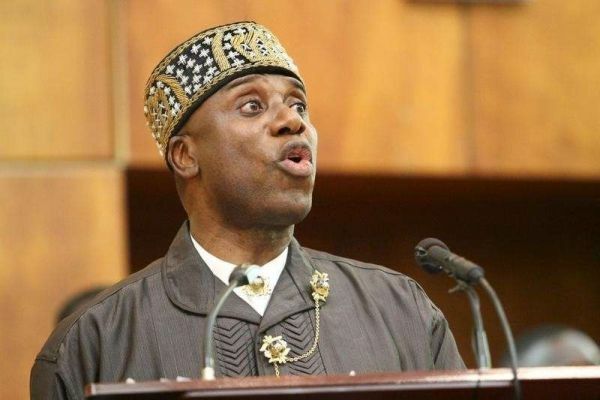 So while we are working hard to make sure that the rail is delivered by this year ending, FG has also awarded a contract to deal with the road from Apapa and Tin Can to enable us evacuate cargoes freely and that is an addition to the rail,” Amaechi said. Also addressing the correspondents, Ambode thanked the FG and the Federal Executive Council, FEC for approving the reconstruction of the Tin Can-Apapa-Oshodi expressway up to the toll gate on Wednesday. Ambode further thanked the Ministers of Transport and Works “because the road construction that is commencing in Lagos next week is actually from Apapa Port up to Ibadan. “That means we are having a two pronged approach to be able to cart away cargoes from Lagos to other parts of the country. “We reinterate the commitment to collaborate with the FG as a State Government to make sure that we reduce the sufferings of Lagosians and I am happy that we have come out of this meeting stronger together with the FG and transport ministry to make sure that this particular rail project is delivered in the next 12 months,”Ambode said.